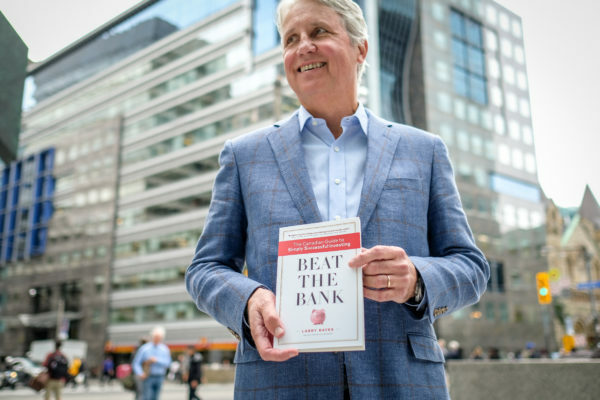 Larry Bates is a former banker turned investor advocate, author and speaker. Larry currently serves as a Member of the Investor Advisory Panel of the Ontario Securities Commission and as an Ambassador of the Transparency Task Force. After exchanging a couple of emails, we met at the Toronto Reference Library on October 17, 2018 (Wednesday @ 1400) for this interview. The duration of the interview was 19 minutes and 44 seconds. Urgen Kuyee: Hi Larry, why don’t you let my readers know a little bit about yourself? Which school did you go to? How did you get into personal finance? Larry Bates: Sure. I grew up in Maritimes and I went to Dalhousie University. I spent a career in the finance business, in the investment business, most of that time with RBC Capital Markets in both Toronto and London, England. I spent my time working with large sophisticated institutional investors as well as large corporate institutions. So, not with average individual investor but on the institutional side. UK: You have enjoyed a thirty-five year banking career with several major financial institutions in both Canada and the U.K. What advice would you give to a smart, driven college student about to enter the “real financial world”? What advice should they ignore? LB: I will say it is an exciting field to be in. There are lots of opportunities and constant innovation in finance. But it is not as mysterious as is often portrayed. Take the time to learn about finance and then, figure it out from there. UK: Let’s talk about your book, Beat The Bank. What led you to write this book? LB: Sure. A few years ago, I got a call from my sister and she said to me, “Larry, all I hear about is how well the stock market is doing but this bank mutual fund that we own has not been doing so well over the past 15 or 20 years and we don’t understand why. Can you have a look?” So, I looked into it and found out quickly and told my sister she was paying 2.3% in annual fees. She had no idea about the fees. She asked me if it was 2.3% of her gains but it was 2.3% of her total assets every year for the past 15 or 20 years, which means she has lost 30 or 40% of her money in fees. She was upset. But, like most Canadians, she didn’t understand the extent of the fees she was paying and certainly, didn’t understand the impact of those fees have over time on your return. She was very disappointed so was her husband. Her retirement savings are very important to her. I didn’t feel very good after that conversation. I understand it is a business and I am all for profits but a business is also supposed to serve clients well and I felt the investment industry is not really serving the majority of its clients well. It bothered me and it ended up with me writing this book. UK: How long did it take you to write the book? UK: Can you tell us more about your T-Rex Score? What is it and how do we determine our T-Rex score? LB: T-Rex score is a little tool which is on my website and it will tell you what the impact of investment fees is over time. T-Rex Score will tell you how much of your total return overtime you actually end up keeping. Let’s say you have an investing time frame of 25 years and you make an assumption that the average returns of the underlying asset will be 6% but you are paying a fee of 1%. When we do the math and subtract the 1% fee, it will tell you that you are retaining around 72% of your return. So, the 1% fee translates into a loss of 28% of your gain over the period of 25 years. I would say the true fee is 28%, not 1 %. And, if the fee that’s being deducted from your account is 2% a year instead of 1%, that T-Rex score drops down to about 50%. You retain only about 50% of your return. 50% is lost in fees over the period of 25 years. It is catastrophic, it is crazy. Most Canadians work hard, sacrifice to save, risk their money and trust their bank to treat them fairly and they lose 50% of their money to fees. It just makes no sense. So, the T-Rex score makes that clear and you can go to my website larrybates.ca and you can run your own numbers. 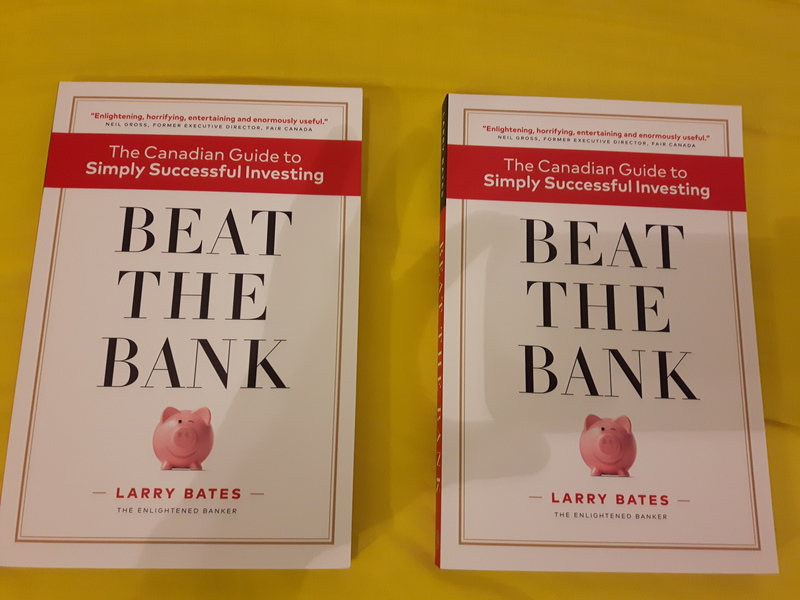 Larry was kind enough to bring me two copies of his book, Beat The Bank. Comment below what you learned from this interview and you will be placed in a draw to win a free copy. I am giving away both copies. LB: I am not sure any book had a huge influence but a couple of great books come to mind. The Little Book of Common Sense Investing which is written by Jack Bogle is my favourite investing book and I think The Seven Habits of Highly Effective People by Stephen R. Covey is a very inspirational guide to living. UK: Let’s say a 27-year-old nurse, she makes about 60K/year and wants to save about 10 percent yearly for her retirement. Would you tell her to go with a TFSA or an RRSP? LB: By far the most important thing is to actually save that 10% and get it into either a TFSA or RRSP. There is no right answer as to which type of account is better but if you expect that you will be withdrawing money at a lower tax rate come retirement, then an RRSP may make more sense. At 27, I would tell her to focus on her savings and automate the process. UK: Larry, do you mind sharing how do you invest your money and what’s in your portfolio today? UK: Yes, me too. Being a shareholder and owning bank stocks is a different ball game. LB: Exactly. I also own utilities, railways and telecom companies, these dividend paying stocks in my portfolio. Then, most of my US investments are through low-cost index funds, S & P 500. I have added GICs in the past few years but previously I was 100% equity. UK: Lastly, what are bad recommendations you hear about personal finance and investing in Canada? What advice should Canadians ignore? LB: Do not blindly trust financial institutions and their advisors. Most sell really bad, expensive products that strip away a massive chunk of your money. Take a bit of time to learn investment basics and you will be able to make much smarter investment decisions and keep your money where it belongs…..in your pocket! UK: Thank you Larry. Where can people find you? LB: People can find me at larrybates.ca and you can find a whole array of useful information in the website. People can also email me at larry@larrybates.ca for any questions or enquiries. If you are interested in buying the book, you can find it in stores across Canada and in both print and ebook format on Amazon and Indigo. Of course, you know on the Amazon site, you can take a little peek inside the book if you want to. Previous Post What is the best money advice you have ever received? Next Post I was a victim of credit card fraud, here’s what I did. I totally agree with Larry and Urgen. Purchase bank stocks and enjoy the ride as banks make profit year after year. I learned that even though a fee might be small, it adds up a lot over time. Therefore, it is important to educate yourself on low cost funds through a discount broker or alternative.